Snuggle up with a cup of Christmas Cheer and find a cozy spot by the tree while you enjoy our special holiday issue. We don’t want you to miss one minute of the excitement and fun going on through the month of December up and down the Mississippi Gulf Coast. 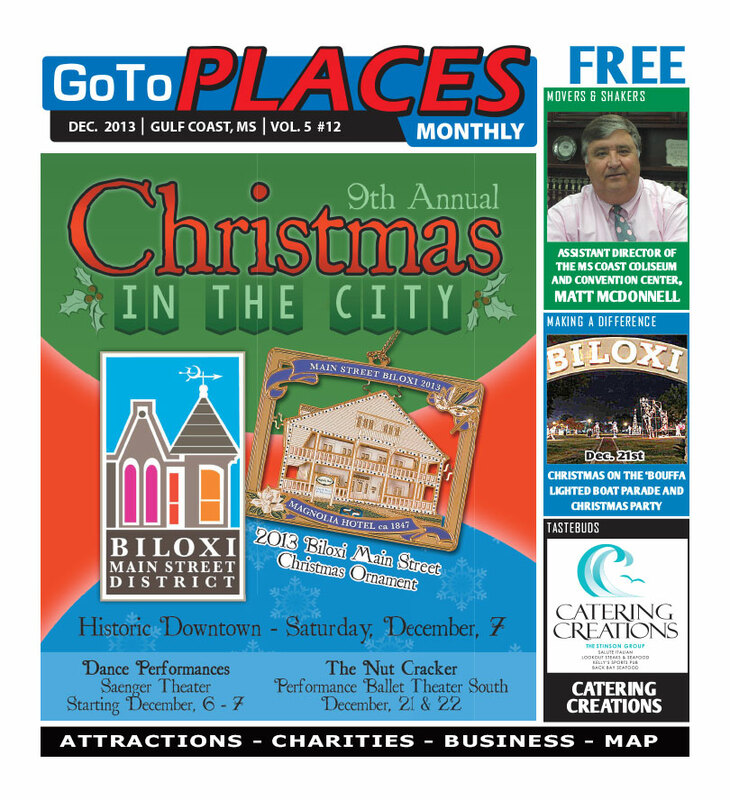 Go To Places Monthly has the full list of things to see and do with your loved ones this holiday season beginning with Christmas in the City in Biloxi! Celebrate the grace and charm of one of the oldest cities in America and shop to your heart’s content on Saturday, December 7th. All of downtown will be transformed into an outdoor Christmas village where you will find the most unique gifts and surprises! Meet Matt McDonnell, Assistant Executive Director of the Mississippi Coast Coliseum and Convention Center. He takes us behind the scenes of his fascinating career. The Stinson Group continues to grow and make it’s mark in South Mississippi. The latest venture in culinary excellence is Catering Creations, exclusive to the historic and beloved beachfront property of Grasslawn in Gulfport. Chef Rob Stinson and his very gifted staff will create a magical event that exceeds all your expectations.